Pathfinder Adventures contains a lot of moving parts, not all which are fully detailed by the in-game rulebook. This is especially the case for anything added on top of the original card game. In an attempt to remedy this, the post below endeavors to explain any game mechanics not clearly defined in the app itself. It is broken out into two broad categories: Systems, for anything that applies to the free-to-play collection layer and scenario setup, and Gameplay, for anything that relates to, well, actual to in-scenario gameplay. This reference is a work in progress, and by no means complete. I’ll add things as I find them or think of them, and welcome any suggestions for additions or corrections. I’m also using screen shots from the iPhone version of the game and if someone would like to provide some higher res captures from the tablet version I’d be happy to use them. Note: The rule book for the physical card game is a useful resource, and it can be downloaded for free here. Do Villains and Henchmen Count as Barriers or Monsters? Cards are the core of Pathfinder Adventures. Nearly everything you do relates to them, and each one contains a lot of information. To begin, here’s a basic walkthrough of the what’s displayed on every card starting from the upper right and going clockwise. Check Requirements: Any information about the checks performed on this card during a scenario. Border: Treasure and unlockable cards have a colored border that denotes their rarity. For the example above, Hunter’s Chain is an epic (purple) treasure card. Powers: The main text of a card that describes it’s fiction in the game. Deck Assignment: Which of the main deck blocks this card is grouped with, Hunter’s Chain part of adventure deck 2, The Skinsaw Murders. Type: The card’s type, armor in this instance. Traits: Any traits a card possess. Traits are special conditions that interact with other cards. E.g., some monsters can only be defeated by cards with the Magic trait. 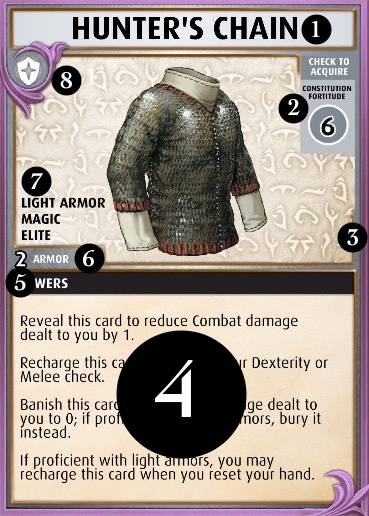 Type Icon: The second indicator of this card’s type, the little shield is associated with armor cards. The vault is the storehouse and gallery of all the cards you own and have unlocked. The two bars along the top of the screen sort all cards in the vault by their deck assignment and type. The number to the right of the deck tabs (1554/1169 in the image) is the number of cards you own and the total number of individual cards available to be collected. The number on the left is higher because multiple copies of treasure cards get counted in this tally. Below the sorting tabs in the main viewing area. Swipe left or right to scroll, and click on the centered card to zoom in on it. On the lower left of the vault screen sit the filter options. Owned: shows all cards of the currently selected deck/type tab that are in your collection. All: will display every card available to be collected. Treasure: filters out adventure cards, showing only the treasure cards, whether you own them or not. At the lower right are a series of buttons that will display separate screens with information on dice, adventures, and locations. The cards button shown here returns to the main vault screen. Every card in Pathfinder Adventures is divvied up into an assortment of categories and classes. The most familiar and well documented of these are the card types (e.g., monster, barrier, item, armor, etc.). There is also their deck assignment, which was discussed in the section above. Another important category of cards is their source. Where a card comes from and how you obtain it has a variety of implications for how it is used by the game and its systems. The four different sources of cards are: adventure decks, treasure chests, loot rewards, and unlockable rewards. Adventure deck cards: come in the pre-made bulk decks with each new adventure. Their contents are locked so when you buy, say, Hook Mountain Massacre; you always get the same set of banes, boons, locations, etc. from the package. For most all purposes, the Character [C] and Promotional [P] decks count as AD cards. The vault and the in-game store don’t provide a great way to view what’s in these decks, but you can find Pazio approved PDFs of some of the decks on the Pathfinder Wiki, here. Treasure cards: are gained by opening treasure chests, and each one has a colored border that corresponds to its rarity: copper for common, blue for rare, purple for epic, and gold for legendary. Along with their fancy trim, treasure cards have a deck assignment that corresponds to one of the adventure decks. However, do not mistake them for adventure deck cards as they are mechanically different from in some significant ways. See the next section of this guide for details on those difference. To view which treasure cards you do and do click on the treasure filter button in the lower left of the vault screen. Loot cards: are the special cards with orange backgrounds awarded for completing certain story scenarios. The in-game rulebook covers their specifics quite well, so I won’t go into detail about them here. While mostly identical in gameplay, these two kinds of cards have some major differences in their underlying mechanics. Salvaging Cards: Treasure cards may be salvaged (destroyed) one at time to remove them from your vault and recoup a small sum of gold. To do this, enter the vault and zoom in on a treasure card in the viewer, a salvage button will be displayed on the right-hand side of the card. Adventure deck cards cannot be salvaged. They are invincible. Toggling Treasure Cards in Story Mode: In the game’s settings menu, there is an option to toggle Treasure cards on or off during story mode play. When turned on, treasure cards will not appear in location decks during a scenario. Treasure cards cannot be disabled in quest mode. Location Deck Construction: When the game is assembling location decks in preparation for play, it draws AD boon cards and Treasure cards (which are all boons) from the vault differently. All adventure deck boons which are valid for the scenario go into the location pool, while only about 10-25 treasure cards per-adventure deck are added. So for example, a scenario in The Skinsaw Murders will form location decks drawn from a pool containing all the AD boons from decks B, 1, 2 but only 30-75 treasure cards, i.e. 10-25 from each of the valid decks B, 1, 2. Vault Maximum: The number of adventure deck cards in your vault is fixed, you get however many came with the adventure and no more. The Haste spell is an AD card; you receive 2 of them with The Skinsaw Murders adventure, and you will always have 2 of them in your vault. On the other hand, your vault can contain as many copies of a treasure card as you’ve opened from chest. If you’ve gotten 10 Fox allies from booster chests, then that’s how many will be in your vault. There is one more difference between adventure and treasure cards, how the game handles going over the vault maximum, and it’s big enough deal to warrant its own section. The amount of a specific AD card held across all of your saved party members can exceed the vault maximum, but the amount of a treasure card cannot. This situation arises because of a quirk in how the game assembles location decks, which makes it possible to exit a scenario with more copies of a given card than is currently listed as the maximum in your vault. To be brief, when drafting cards in preparation for play, the assembly system checks the contents of your character’s decks and subtracts them from the vault total so that you won’t see boon cards which exceed your vault maximum. However, the system only checks and deducts the decks of your currently assigned party. Any additional saved characters and their deck contents are exempt. As a result, you can find and acquire instances of a card which exceed your vault maximum when summed across all characters, allowing you to leave a scenario with “extra” copies of a card. When this happens with AD cards, the game doesn’t care, and you are free to retain as many copies of AD cards as you can sneak out of a scenario. But with treasure cards, it takes note. Every time you load into the party management screen, your total inventory of cards is checked against the vault, and any instances of a treasure card which violate the maximum limit are deleted. Example: Ezren and Seelah attempt Battle at the Dam in the Hook Mountain Massacre adventure. Ezren has 1 Scry in his deck, and Seelah has 1 Legion Armor in hers. Outside of the Scenario, there is a saved of Lem with an additional copy of each card. Scry is an AD card, and so its vault count is fixed at 2, the number that comes with the HMM adventure deck. Legion Armor can exist in as many copies as a given player has opened from chests, but for this example let’s assume that this player also has 2 copies of Legion Armor in their vault. This means that both Scry and Legion Armor are at their max vault cap, but due to the aforementioned quirk, it is possible for Ezren and Seelah to encounter additional instances of each card while playing the scenario. Say that they encounter and manage to obtain both an additional Scry and another Legion Armor in the course of play. That now puts them 1 over cap on both cards. When they are done with the scenario and move on to the deck editor, these extra copies will still be there, and in the case of Scry, it can be carried away out of the scenario without worry. The Legion Armor can be taken out as well, however, it will be deleted from Seelah’s inventory the next time she visits the party management screen. 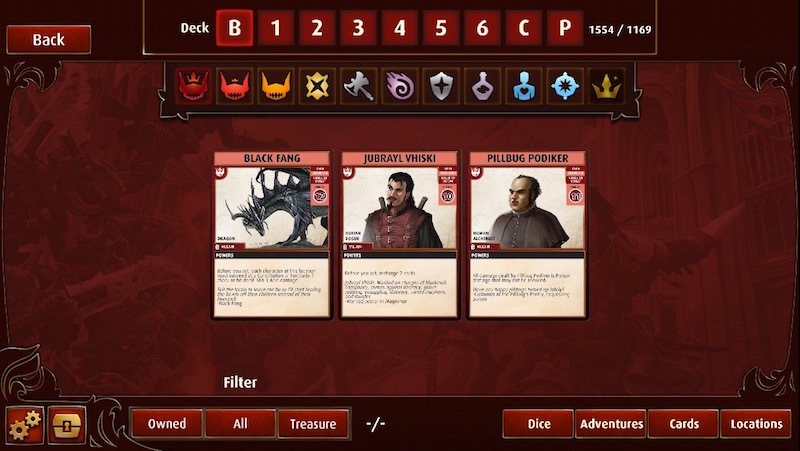 The majority of the actual gameplay in Pathfinder Adventures revolves around the interactions between two types of decks, those being the player’s character decks and the location decks. You should already be familiar with the player-character decks. They are the decks associated with each of your characters, and you know what’s in them because you built them yourself. Location decks, however, are those mysterious heaps of ten cards from which spring forth all good and ill you’ll experience during play. The mechanics that go into building them are… a touch Byzantine, but understanding them gives a lot of useful insight into how the game functions, so let’s take a look at how they’re put together. 1: All adventure deck cards of the appropriate level are added, except for villains and henchmen. 2: The promotional [P] and character [C] decks are added. 3: A proportion of treasure cards are added, ~10-25 from each adventure deck in the pool. 4: The decks of the party attempting the scenario are subtracted. 5: A proportion of cards from earlier sets are subtracted (see Culling, below). 6: The cards randomized are dealt out by type to as many locations as needed. 7: Once all location decks have their 10 required cards, the scenario is ready to begin. Culling: Beginning at adventure deck 3, a percentage of the cards with a Basic trait are removed from the draft pool. Differences between story mode and quest mode: because Quest mode scenarios are not associated with a specific adventure decks, the pool of available cards is determined based on the current tier of the party. I do not yet know how these tiers correspond to the adventure decks for the purposes of filling the location draft. Story Mode: Normal and heroic only pay out their gold once, only legendary provides repeatable rewards. It gives a base 50 gold, plus an additional 50 for every character in your party, for a total of 100-350 gold. Daily Quests: Challenges that reset every day and give 100-200 gold for completing their objectives. Closing Locations: Any location you close during a scenario yields a small amount of gold, about 5-10 depending on difficulty. Clearing banes: Defeating monsters and barriers also gives a small pittance of 1-3 gold based on difficulty. An Ill Wind: The difficulty check to acquire boons are increased by x (scales with adventure level). Blood in the Sand: When you discard more than 1 card as damage from a combat check, bury 1 of those cards. Darkest Night: The difficulty of checks to defeat banes is increased by x (scales with adventure level). Driving Rain: The difficulty of all checks is increased by x (scales with adventure level). Full Packs: When you acquire a weapon, an armor, or an ally, bury a card. Impending Doom: The blessings deck includes 5 fewer cards. Night Approaches: When you fail to acquire a boon, discard the top card of the blessings deck. Painful Memories: When you acquire a spell, an item, or a blessing, bury a card. Less of an undocumented feature and more an unintended consequence of trying to translate a physical card game into a digital space. At the end of a scenario, you are required to pare your decks down to their maximum limit, but once outside the scenario, you can trade items freely between any of your saved, i.e. “experienced” characters. The result of this functionality is that you can extract boons from a scenario by giving up a boon that’s easier to reacquire. So if you get something like a Wand of Enervation that you don’t currently have a use for, but would very much like to keep, you can have Sajan toss away a Staff of Minor Healing to pull the Wand out and then tuck it away on another character. Sajan might have to make do with a filler item for a while, but healing sticks are pretty easy to come by, compared to the wands. You can even create a crop of characters used entirely for holding valuable boons you don’t currently need. I have three, named Stashes 1-3, and they’re all toting a wide array of stuff like situational spells, extra Sihedron Medallions, and spare animal allies for Lini. Technically this is in the rules, but it’s hidden away under the “Hand Size” entry. When you reset your hand, you may discard any number of cards and are required to discard any number of cards that exceeds your maximum hand size. After, you must draw however many cards are needed to restore your hand to its maximum size. Usually, it happens at the end of every turn, but there are other effects which can trigger it. Yes, I mention it above, but it’s easy to miss, super important, and the way it works in-game is very unintuitive. During a hand reset, like the one at the end of your turn, you have the chance to perform actions. If you look up in the right-hand corner of the interface, on the phase bar, you’ll see a little orange trashcan icon is lit up just to the right of the end turn arrow. Click on that to voluntarily discard any of the hands in your current hand. They can be either one. Most are monsters, but a handful are barriers. The poison traps from the Poison Pill Scenario are one example of a barrier henchmen. The exact type of any given villain or henchmen is listed in the on the card along with the check requirements, and any card which effects barriers or monsters will effect villains and henchmen of the associated type. Location Deck Construction in Quest Mode: I do not fully understand how location decks are drafted in quest mode. I know it is tied to your current party tier, but am unsure of the specifics. Anyone know? Ethics Gradient: location deck construction, card caps, and treasure card probability. firestormkirby: gold rewards, card caps, and vault info. - Updated Open Questions sections. Edited by Nym, 21 September 2016 - 10:34 AM. Gold Rewards The daily quests give 100, 150 or 200 gold (and possibly other values). And I believe you get either 1 or 2 gold (varying)from beating monster - as well as 5 for closing a location permanently. gold from banes and closing scale with party level and difficulty. At Tier 4 Legendary, banes give 1-3 gold with the average (based on 125 samples) is 2.1, and closing (which scales in odd numbers) is 11 gold. Treasure cards over the cap: As stated earlier, I’d like to confirm that exceeding a treasure card’s count in the vault while in a scenario will cause that boon to be removed from your character’s deck once they return to the map. Quest deck locations: I do not know how quest mode decides which adventure decks from which to draw its location decks. 1317/1169: In the vault, to the far right of the deck tab, there is a pair of numbers. I assume this is some kind of indicator for how many of the total available cards you’ve unlocked, but mine currently reads 1317/1169. Any clues as to what this is for? -/-: Similarly, in the filter options beside the treasure button there is “-/-“ anyone know what this is? Cards over the cap: I have never encountered a boon when the party deck was at the maximum amount I had across the 6 characters in the party, but liek your example with haste you can get more cards across the 11+ characters, once they are in the same party, one of the cards gets kicked and you are required to replace it from the "box" before attempting a scenario. Same thing happens if you salvage a card in a deck and there are now less cards than the parry "owns." Quest locations: I believe the game has 2 different location set-ups each Tier based loosely off the appropriate AD deck. So that makes 6 different location set-ups at Tier 4, there are no "special" locations and all the locations are generic to work with each other. It is random which set-up you get. NOTE: I only play with 6 character parties, so this could be completely different for lower level parties, but it will still probably be the same pool as what I have gotten. The vault X/1169: 1169 is the number of cards in the "box" plus all the treasure cards (single instance) available to get. The top number is the number of cards you own total, so let's assume you have 1 of every treasure, you would have 1169/1169, if you get 1 more treasure card it would be bumped to 1170/1169. This counter could definitely be improved upon, but not a big deal. The vault -/-: This used to show the count of what you are viewing over what you owned. Let's make 3 independent assumptions About the Weapons in AD1 to make examples: You own no Treasurer, you own 1 of each treasure, you own 2 of each treasure. Below is each scenario that can happen, based on memory of what it was like before the recent patch, however, I didn't pay too closely of attention so some information could be wrong. Okay, so it sounds like the -/- thing is just a broken UI widget. Good to know. This applies to treasure cards, but it doesn't appear to be the case for AD cards? I frequently run scenarios with 4+ copies of Haste, Scry and Swipe across my party and they never get removed. Edited by Nym, 19 September 2016 - 02:36 PM. Add all the decks up to your Adventure Deck level (or Quest Tier) to the Vault. Quests use their own "modified" ADs, not story-mode ADs. Add in Promo Cards and the Character Deck if you have them. Add a random selection of your treasure cards. Not all treasure cards are added to the vault each scenario. Remove any cards your characters may possess from the Vault. It is okay if you have more of a card than you're supposed to, the vault doesn't know the difference. Starting at AD3 (or Tier 3), randomly remove a percentage of cards with the Basic Trait. Yes, it only applies to Treasure Cards. Treasure Cards over the limit should disappear during party management. It could easily apply to normal campaign cards too, but it currently does not. In a bit of muddled nomenclature, the term monster has two meanings in this game. It is both a subdivision of banes (monster, barrier) and a type of card (e.g., villain, henchmen, monster). This causes some confusion because there's some stuff in the game target monsters specifically. For example, the Enfeeble spell card states “Discard this card to evade a monster; put it on top of its location deck.” At first blush, it is unclear if this affects only cards with the monster text or all monster banes. For the record, it’s all banes. Unless stated otherwise, anything that affects a monster will effect villains and henchmen. Banes are villains, henchmen, barriers, and monsters. Villain and Henchmen also have a type: barrier or monster. This makes the language on cards like the one you cite much simpler -- imagine if a card had to say "a monster, villain or henchman" everywhere the a card just says "monster" now. Real estate is precious on these cards; it is important to save words. Also, not all villains and henchmen are monsters. You have to look at the type. (As it turns out, Runelords has no villains which are barriers, but later sets do. An example of a henchman barrier is Poison Trap.) Cards that work on barriers work on henchmen and villains of type barrier. Edited by elcoderdude, 19 September 2016 - 05:16 PM. The poison traps are barriers. I'm dumb and can't read very well apparently. Edited by firestormkirby, 20 September 2016 - 11:57 AM. The poison traps are barriers. That's what he said. I've added emphasis to make it easier to see. Updated with all the extra information I've gotten. Thanks to everyone for the commentary. Pinned for awesomeness! Thanks Nym, this is incredible! Great work! Congrats on the Sticky, Nym! Here's another bit of fun info. Salvaging Cards: Treasure Cards have a gold value based on rarity and whether or not it possesses certain traits. The following table illustrates the derived rates. The center column, , is "neither Basic nor Elite." The cards you get as AD rewards (Samisen, Orik's Shield, Skinsaw Mask, Black Arrow Longbow) are technically treasure cards, but they cannot be salvaged. The same goes for the Goblin Golem of Obsidian. Previously, all cards discarded after a scenario were "salvaged" on their way back to the Vault, potentially earning the player a couple dozen extra gold. This feature has since been removed in favor of other new sources of gold (daily challenges and whatever else may be on the horizon...). Also of note, when Salvaging cards while in quest mode (as opposed to the Gallery in the options), you get a 2.1x bonus on salvaged cards. Meaning a Basic Uncommon gets 17 gold, and an Elite Epic gets 50 gold. How is it you salvage cards in quest mode? The card pool is the same, so it does not differ from story mode in that aspect. Same sort of issue with gold from defeated banes. For example, Elites have a higher average payout compared to Veterans. Took a while to build up enough data to compare to how I thought the game was handling things. Issues like this likely just got lost in the "noise" of randomness. Not a big deal now, but the vast majority of elite cards should disappear from play at AD6. Though, by then average payout for all monsters should be roughly the same. I get that. What I don't understand is how to salvage cards from the vault without doing it through the gallery. Question: Is the ratio of treasure cards to adventure cards the same in both story and quest mode? I've been leveling a quest mode party, and it feels like I'm seeing a much higher proportion of treasure cards. I'm level 31 now and I haven't seen a single Haste spell. Oh okay, I just got my answer, but it raised a new question. I haven't seen Haste because it's tagged as deck  in quest mode. What's up with that? Edited by Nym, 01 October 2016 - 04:09 AM.